I thought I would write an article about buying on an impulse and how you should be careful about buying a car in the dark and wet,. or by impulse alone from a picture and description by the owner. I have a really beautiful 1969 Buick Skylark, which I bought in the dark and wet, this was featured in the July 2002 Magazine. 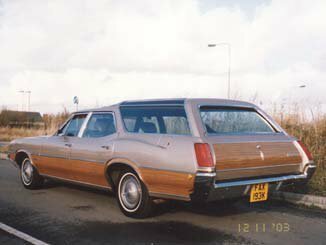 About ten yeas ago I owned a nice Chevrolet Caprice Station Wagon and have wanted another similar car ever since, as I like big American Wagons. 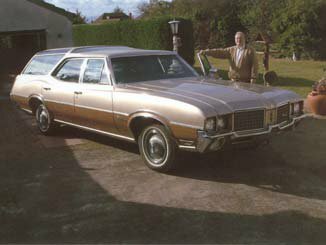 About two years ago I started looking on the Internet at the US sites that sold collectors cars, I had a list of cars that would fit the bill, but my favourite was the Oldsmobile Vista Cruiser or Buick Sport Wagon. I kept looking and was tempted on many occasions but none really hit me even though some were restored to a high standard etc, I didn't want any major work either. I did ring up about a rather nice '73 Chevrolet Caprice, but this was sold, so back looking again, I was getting fed up after nearly two years of looking. One morning I saw my car, 1972 Oldsmobile Vista Cruiser 43.000 miles, in New York State, I had a gut feeling immediately that this was the one, without doubt, I rang the owner, I had to leave a message on an answer phone, next day he rang me and told me about the car, that he'd bought it at an elderly ladies estate sale with only 30,000 miles on it and. he had put 13,000 on I asked him to send me some 'Email pics which he did, and it was perfect, except for one patch on the front seat where it had lain in the garage and the sun had spoilt one spot of it, but the rest of the interior was like new, so was the exterior wood grain, which can fade when in use, all the chrome body was like new. He had it resprayed because of long term storage there were marks on the paint but as a bonus he had put new shocks, all the engine service bits, water pump etc. and a new set of tires. This was surely a find of a lifetime, 1 managed to drop the price a few hundred dollars, and the deal was done. His next question was "how are you going to get it over" I said I don't know but I'll find out. I had 'phoned Kevin Hill at Rybeck Shipping earlier in the Year about the Chevrolet Caprice, he was very helpful, so I 'phoned him again and gave him the details. It needed to be collected from the seller and brought to port this entailed a 200mile journey, quite costly, then shipped to Southampton then from Southampton to S Wales, another lengthy journey, Rybeck arranged it all, and were very helpful, I would recommend them. I wired the money to the seller, then had an agonising wait for the car to arrive, weeks of worrying would it be like he said, would it be doctored up, but I knew in my heart that she was a good one. Finally the day arrived when she was being delivered, I had an anxious wait to see this monster coming down the road on the back of the transporter. Eventually it came, soon as I saw it J loved it, it was magnificent, nothing missing or bent after ifs journey. 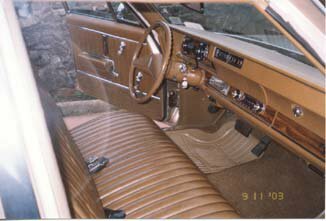 It had all the original documents in the glove box, including the original bill of sale. handbooks etc. I arranged for an MOT. And then after a drive, and it drove like a new car. everything felt perfect, I had a large grin on my face, a friend saw it before I cleaned it “I would like that” and said he would pay the whole cost that I'd paid for it, no way was I selling this beauty . It is very rare to find one in the condition. And I think it is the only one in the country . This is one time when my heart ruled my head. no I'd already bought a Buick in the wet,now I've bought a car over the Internet without seeing it.